Enjoy the best Christmas celebration in America with a Branson Vacation. And this year having a Branson Christmas is more affordable than ever thanks to shops and resorts in Branson offering holiday discounts. Branson, Missouri is often called the home of America's Christmas celebration and visitors this year will have more reason than ever to celebrate. Not only are Branson's shows and attractions pulling out the stops with their biggest Christmas shows ever, several stores and a Branson resort are offering discounts as an early present to area visitors. One of the most enduring Branson Christmas traditions is also one of the most famous. An Old Time Christmas at Silver Dollar City brings together tradition and modern twists with breathtaking shows and displays around every corner. Guests can partake in the tradition of an old fashioned Christmas with carolers, home-style comfort food, and handmade crafts that make unique and memorable gifts. But modern twists can be found with more than 4 million Christmas lights lining the streets and buildings, topped off with the spectacular Gifts of Christmas Light parade featuring over 300,000 lights. Or guests can be a part of the 165th anniversary of Dickens' Christmas Carol by seeing it performed live on stage with talented actors and state of the art special effects and production. With over 40 shows, 4 million lights, and home-style crafts and cooking guests will see why Silver Dollar City is a Christmas Tradition in Branson. There's even more to see in Branson, with an Ozark Mountain Christmas in full swing. With classic favorites such as the Dixie Stampede Christmas Show, Shoji Tabuchi's Christmas Spectacular, and the Branson Area Festival of Lights or new favorites such as the Titanic decorated for the season and Christmas with the Beatles at Liverpool Legends, visitors won't have a shortage of entertainment this holiday season. With the holidays comes gift shopping, and Branson offers plenty of that too. From Tanger Outlet mall and Factory Merchants Outlet offering discounts on thousands of brand name items to the one of a kind shops on the Branson Landing there will be a gift for everyone on the list. Many stores offer special holiday hours and discounts starting with the thrill of Black Friday midnight openings for the serious shoppers. With all the shopping and shows to take in most visitors will need a quiet, relaxing and affordable place to stay in Branson. Thousand Hills Resort meets these criteria and more, with special Branson discounts on their most popular choices. 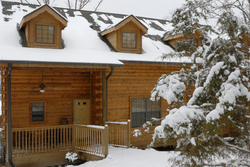 Guests can choose from discounted two, three & four bedroom center-city golf view condos or cozy log cabins. Whichever option they choose guests will be treated to fully furnished rooms, including kitchens and living rooms with cable TV and free high speed internet, the most convenient location in Branson, and a friendly and experienced staff that has been providing a home away from home in Branson for nearly 20 years. With all the shows, shopping and places to stay it's clear to see why Branson is an integral part of the Christmas tradition for thousands of visitors each year. With more experiences than ever and more affordability than ever, 2009 is the best year for new guests to start a Branson tradition of their own.